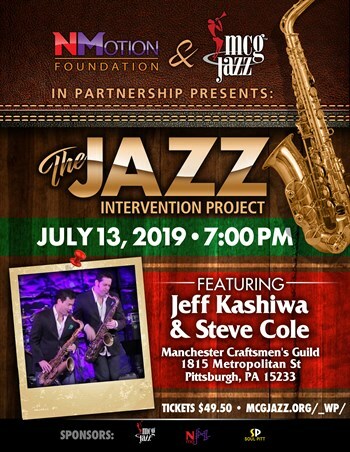 The N-Motion Foundation will be presenting jazz artists/saxophonists Jeff Kashiwa and Steve Cole at Manchester Craftsmen’s Guild on July 13. The N-Motion Foundation is N-Motion Entertainment’s new non-profit organization that will provide charitable donations to organizations like the VA, American Cancer Society, and music education for disadvantaged youths. The Jazz Intervention Project will resurface providing opportunities for youths to participate in music activities with professional musicians. It is the hope of the N-Motion Foundation that events like this can become the catalyst for young growing musicians. There will be some kind of functional, working, workshop for students on the day of the event. These students will also be treated to free attendance to the concert that evening. Who know, Jeff and Steve may ask one of the students to come up and perform with them! This is what the Jazz Intervention Project is all about!